Post 3 of a series detailing our Eastern Europe road trip. View all the posts so far here. After a Romanian music festival and some time exploring Bucharest, it was time for us to begin our Eastern Europe road trip. 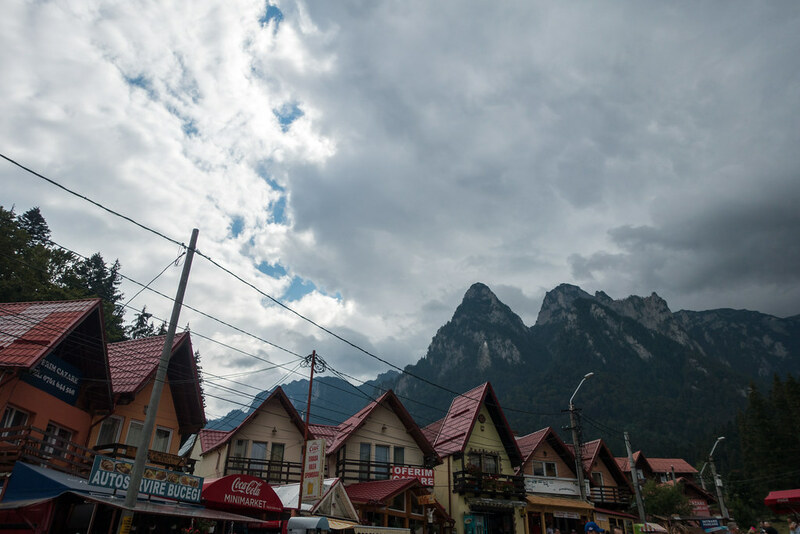 We hired a car and drove the journey from Bucharest to Brasov, but not without stopping to admire the beauty of the Bucegi Mountains along the way. When we saw the car – a white Vauxhall Corsa – we knew this would be a very different experience to our epic road trip round the southwest United States. Romania’s often atrociously potholed roads, not to mention the traffic jams through every town we passed, hammered the point home further: this wasn’t going to be an enjoyable drive for Steve, who was to be at the wheel throughout. 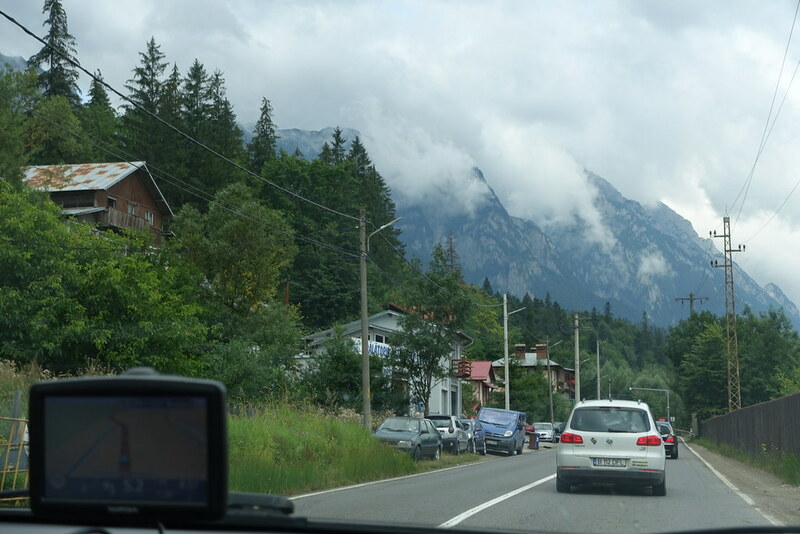 But in a setting as stunning as the Carpathian Mountains, the journey was always going to be enjoyable for me! We stopped at Busteni primarily to ride the cable car up into the Bucegi Mountains, but unfortunately it wasn’t operating due to the high winds. It was cold and the sky was heavily overcast, so we decided against going for a walk in Bucegi Natural Park. Nevertheless, the mountains still looked pretty spectacular rising up behind the row of colourful, triangle-roofed buildings by the cable car station. We wandered back to the main road to find lunch, and went into a restaurant I can’t remember the name of where we had beef strogonoff and grilled pork and polenta. The food was fine, but the service was quite rude (I wished we’d just gotten pancakes from Loco Poco, the hole-in-the-wall along the street with a queue alongside it). Feeling rather disappointed, we determined to find something else to do before moving on. I spotted signs pointing to a monastery and we decided to follow them. 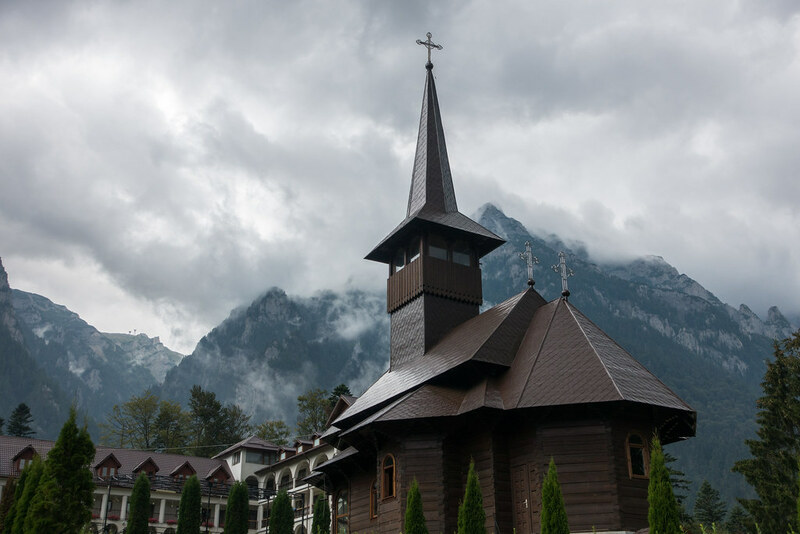 After a short uphill walk through forest we spotted Caraiman Monastery’s various roofs, among them the sharply pointed spire of a dark wooden church, spearing the thick clouds above. 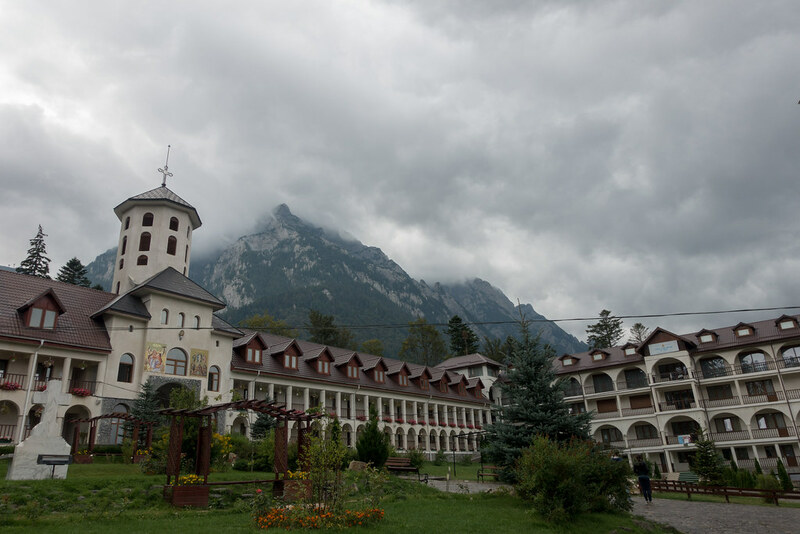 As the full complex came into view I felt that stopping in Busteni had been worth it after all: here was a grand, romantic and almost mythical sight, particularly in front of the dagger-like mountains and atmospheric dark clouds. Upon entering the grassed grounds we heard, and then saw, a monk walking around while rhythmically hitting a large plank of wood over his shoulder. 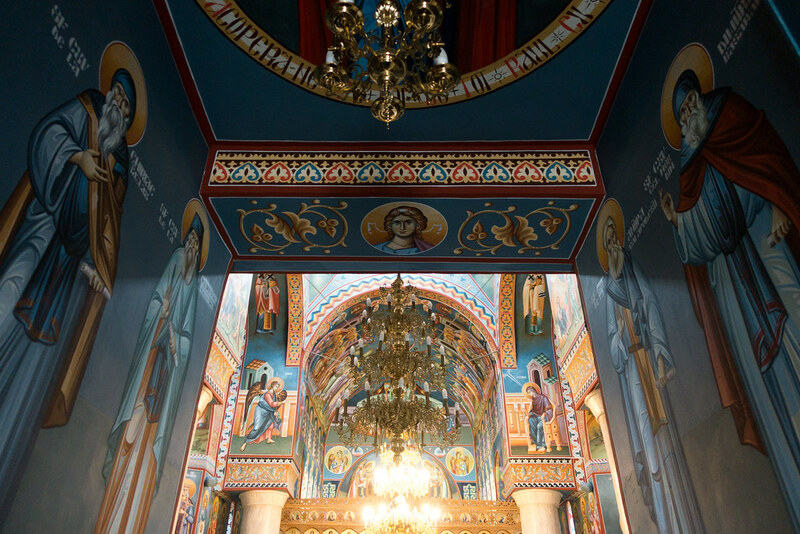 I peered into the main church building and took in the silent room’s many colourful murals, then we wandered off to the side to find some cages containing chickens, some other birds, and rabbits. 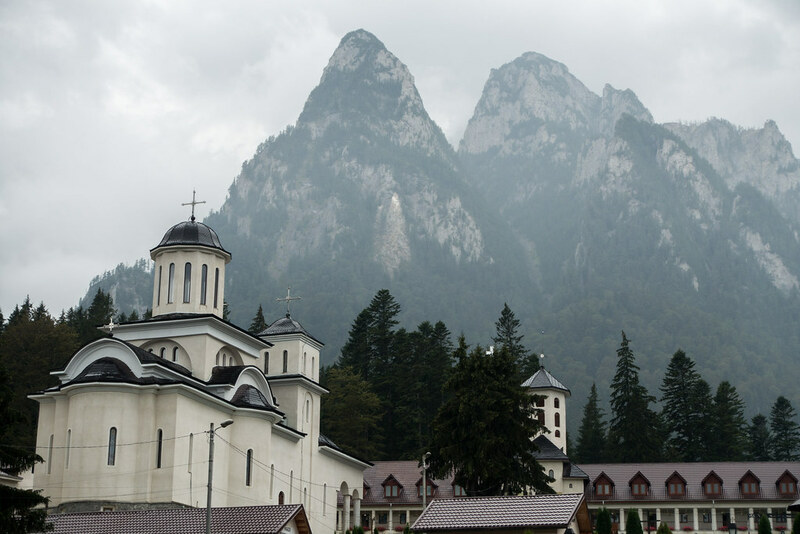 At this mysterious cloud-shrouded monastery in the mountains, I felt like I’d caught my first glimpse of the remote, romantic Romania featured in books such as Bram Stoker’s Dracula. We took an extended walk through the forest before returning to the car, to continue our journey to Brasov. Posted in Eastern Europe, Photography, Romania, TravelTagged Bucegi Mountains, Busteni, Caraiman Monastery, road tripBookmark the permalink. I always recommend visitng the monasteries in Romania, not necessarily for religious purposes, but rather because they are often located in places with the best views. Especially those in the mountains.